The United States has historically distinguished between “desirable” and “undesirable” immigrants (Wheeler 2014). In the late 19th century to the early 20th century, scientific theories developed by Charles Darwin and published in his works, The Origin of Species in 1859 and The Descent of Man in 1871, were extended to social phenomena. Social Darwinism, as it was later known, is defined by Merriam-Webster as “a sociological theory that sociocultural advance is the product of intergroup conflict and competition and the socially elite classes (as those possessing wealth and power) possess biological superiority in the struggle for existence.” Proponents of Social Darwinism believed that social welfare programs that assisted poor and marginal persons, such as immigrants, hindered a process of natural selection and stalled society’s advancement. The CMS archives offer some historical recordings of these eugenics-based arguments on the value and desirability of immigrants. Among the collections is a folder of carbon copies preserved in the files of Bruce Mohler, who served as Executive Director of the National Catholic Welfare Conference’s Department of Immigration from 1920-1965. These copies contain Mohler’s records on the early to mid-20th century immigration debates, which were used to assist the US Catholic hierarchy in presenting the Church’s teaching on the subject. 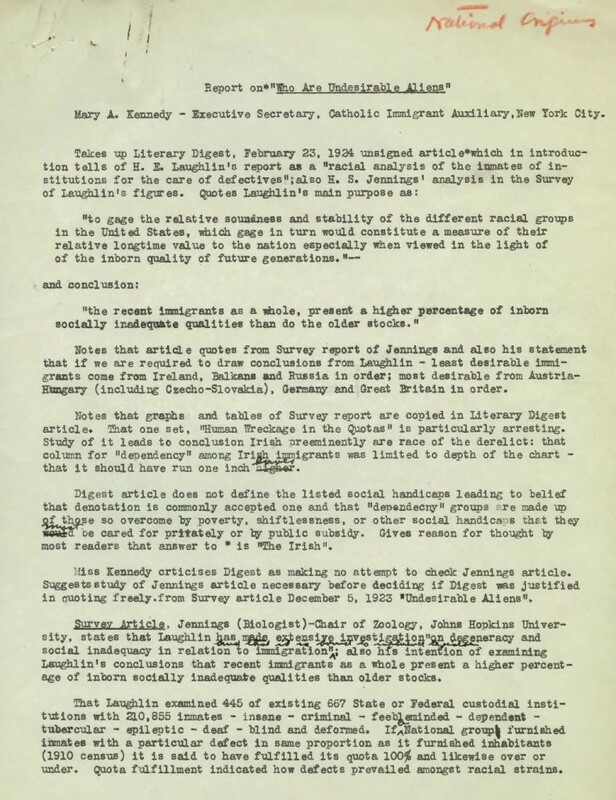 In 1929, Mohler received a request from Mary A. Kennedy, Executive Secretary for the Archdiocese of New York’s Catholic Immigrant Auxiliary, to review a critique she drafted for Cardinal Patrick Joseph Hayes on an unsigned 1924 article entitled, “Who Are Undesirable Aliens,” published in The Literary Digest, a general interest weekly magazine published from 1890 to 1938. The Literary Digest article discussed a report conducted by Harry Hamilton Laughlin, Director of the Eugenics Record Office, on the origins of inmates in state, county and city institutions in the United States. The purpose of the report was “to gage [sic] the relative soundness and stability of the different racial groups in the United States, which gage in turn would constitute a measure of their relative longtime value to the nation especially when viewed in the light of the inborn quality of future generations” (The Literary Digest 1924). Laughlin found, in terms of absolute numbers, people of Irish descent dominated the populations of US orphanages, insane asylums, prisons, tuberculosis sanitariums and homes for the “feebleminded” and “defective” (The Literary Digest 1924). Although the Irish constituted a small percentage of the total US population at the time, they represented a large percentage of its institutionalized population. For opponents of Irish immigration, the findings indicated that the Irish were not assimilating and were costing American taxpayers considerable money. Laughlin concluded that “the recent immigrants as a whole, represent a higher percentage of inborn socially inadequate qualities than do the older stocks” (The Literary Digest 1924). The Literary Digest article also examined “Undesirable Aliens,” an analysis by Herbert Spencer Jennings of Laughlin’s report. Jennings, a biologist, eugenicist and Chief Zoologist at Johns Hopkins University, had been commissioned by Bruno Lasker, Associate Editor of The Survey (a liberal journal), to offer a scientific response to counter Laughlin’s findings. Although essentially tasked with discrediting the biological foundation of Laughlin’s data, Kennedy observed that Jennings did not question Laughlin’s data or methodology. Jennings, however, did attempt to negate Laughlin’s conclusion that immigrants embodied “defective inheritance” (i.e., inferior biological or racial composition). First, Jennings noted that American citizens and immigrants often experienced different environments. Because most Americans lived with their families, they were more capable of receiving care at home if they needed it. Immigrants, however, were often separated from their families and less likely to have the care of extended families. Without these resources, immigrants were forced to turn to state institutions for assistance. According to Jennings, it is “[b]eyond question the immigrant class are bound to show a greater proportion of defects due to environmental pressure than the native class” (The Literary Digest 1924). Jennings also suggested that Laughlin’s data did not include information from the expensive private institutions which would more likely host American citizens. As a result, it could not be established that the number of Irish immigrants in public institutions was so significant as to lead to the conclusion that they were inferior. By the 1930s, the application of eugenics to social science began to decline. Richard Hofstadter, a professor at Columbia University who was famously opposed to Social Darwinism, argued that biology was irrelevant to human social life and that biological explanations of human action and human society were dangerous (Leonard 2009). Americans, however, continue to define and limit the composition of the immigration population by identifying desirable immigrants from the undesirable. According to scholar George Borjas, immigration policy “may stress national origin, or skills, or financial resources, or family ties, or any combination of characteristics that Americans deem economically and politically desirable, and consistent with the country’s values and beliefs” (Borjas 1990). As Borjas points out, there are only so many visas that can be allocated and, therefore, the immigration system must be selective. Even so, the degree of categorical definitions of who is desirable and who is undesirable can disproportionately affect some groups. For example, S. 744, the immigration reform bill approved by the US Senate in June 2013 but stalled in the House of Representatives, included a proposed merit-based point system based on skills, employment history and education credentials to allocate a portion of new immigrant visas each year. In analyzing the requirements, the American Immigration Council found that the proposed system would put certain categories of immigrants at a disadvantage, including: “women; people working in the informal economy (including those who do unpaid work); individual with family ties to US citizens with insufficient human capital credentials (i.e., formal education and employment history), middle age and older adults and applicants from less-developed countries” (Immigration Policy Center 2013). In determining which immigrant groups should be allowed to enter, to stay or to obtain legal status, the challenge of deciding who is desirable and who is undesirable persists. Borjas, George J. 1990. “The U.S. Takes the Wrong Immigrants.” The Wall Street Journal, April 5. http://www.hks.harvard.edu/fs/gborjas/publications/popular/WSJ040590.htm. Immigration Policy Center. 2013. “Defining “Desirable” Immigrants: What Lies Beneath the Proposed Merit-Based Point System?” American Immigration Council, May 20. http://www.immigrationpolicy.org/just-facts/defining-desirable-immigrants-what-lies-beneath-proposed-merit-based-point-system. Leonard, Thomas C. 2009. “Origins of the myth of social Darwinism: The ambiguous legacy of Richard Hofstadter’s Social Darwinism in American Thought.” Journal of Economic Behavior & Organization 71:37-51. Merriam-Webster, Incorporated. n.d. “Definition of Social Darwinism.” Merriam-Webster. Accessed February 12, 2015. http://www.merriam-webster.com/dictionary/social%20darwinism. The Literary Digest. 1924. “Who Are Undesirable Aliens?” The Literary Digest, February 23. http://www.unz.org/Pub/LiteraryDigest-1924feb23-00025. Wheeler, Charles. 2014. “The Evolution of United States Immigration Laws.” In International Migration, US Immigration Law and Civil Society: From the Pre-Colonial Era to the 113th Congress , edited by Leonir Chiarello and Donald Kerwin. New York: Scalabrini International Migration Network.